North Korea marks the first anniversary of former leader Kim Jong-il's death on Monday and the first year of his third son Jong-un's rise to power. North Korea has been in a frenzy of celebration over the backward country's recent rocket launch. Since the rocket took off on Wednesday, massive rallies have been held across the country almost every day and the state media have stressed that the launch accomplished Kim senior's last wishes, thus legitimizing his son's rule. 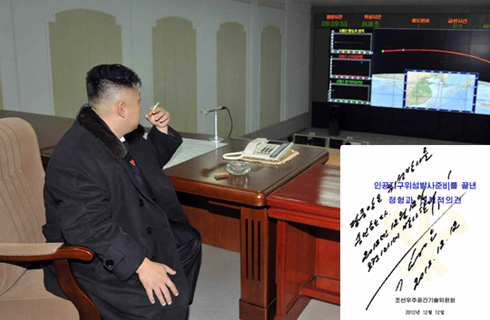 Thursday's Rodong Sinmun covered the rocket launch on four of its six pages, and on Friday the daily reported that Kim Jong-un had given a written order to the satellite control center to launch it and inspected the center later. Wise to the possibility of failure since the last launch in April tanked, the state media had not announced the launch in advance. A South Korean government official on Friday said the regime's excitement is understandable since Kim Jong-un has accomplished nothing else in his first year in power. The regime had long touted 2012 as the year when the North would become "a powerful and prosperous nation," but amid an ongoing food shortage and dire economic straits, the propaganda phrase has quietly been allowed to die. On the day of his father's funeral, Kim Jong-un, who pledged economic reconstruction after adopting his grandfather's old slogan "feed the people with rice and meat soup," told senior officials to come up with new economic measures. He apparently tried to implement some economic reforms, but they seem to have floundered, a South Korean security official pointed out. All the while he has been busy purging party, government and the excessively powerful military to tighten his grip, including demotions for the top military officers who escorted the Kim Jong-il's hearse. Nonetheless he seems worried about overthrow attempts, and security around him was tightened significantly, with armored vehicles deployed at his residence. North Koreans suffered severe flood damage this year, but Kim did not go to any of the affected areas, apparently for security reasons.